Increasingly today, we hear people remark “the world is getting smaller.” The advent of globalization has met with mixed responses across the world. They range from praise for interconnectivity and exchange between people to alarm and contempt towards environmental deterioration and rising inequality. Together, these are the contradictory and ambiguous results of globalization currently unfolding throughout the world. These commonalities, which exist between countries in our contemporary moment, are precisely what allow us to draw a variety of positive lessons from the social and political history of one fundamental human necessity - land. For it is land that lies at the centre of all the questions on economic, trade and environmental policy plaguing governments, lawmakers, activists, and most importantly, ordinary citizens today. When political elites and World Bank officials implement seemingly innocuous, top-down poverty alleviation schemes asking ‘how do we make globalization work for all?’ they fail to see the most basic underlying causes of poverty and destitution in much of the world. In opposition to this institutional ignorance, we witness a variety of people’s movements emerging from below, composed of the landless rural and urban working poor, struggling to survive and at times, taking things into their own hands and voicing their demands through mobilizations, both violent and peaceful. The examples in this document locate these moments of public discontent and pressure exerted on the state to address the need for land rights. In order to reassert the importance of land reform to current questions on global socio-economic structures, we retrace the key components of our arguments. 1. We have mapped the historical trajectories of several countries and asked a basic, but critical question – Why land? Land sustains and fulfils fundamental human needs, from food to shelter. The inability to own land debilitates the tiller/cultivator’s ability to reap the benefits of his/her labour and generate income. A cycle of asset poverty prevents consumption and mobility and therefore exacerbates economic and political dependency. 2. Sure enough, we are not saying that there should be no diversification away from agricultural production for those dependent on land. On the contrary, a proper economic transformation must imply an opening up of new cultivation activities for a land-dependent population. In fact, one may even argue that the whole successful resolution of ‘the agrarian question’ means that dependence on agriculture for livelihood as a percent of GDP and workforce becomes smaller. 3. However, this must not be a forced transfer of people from agriculture to so-called development. To avoid this, redistribution of land becomes a pre-requisite for economic growth and development. 4. It must be emphasized that the models of economic transformation in developing countries will be necessarily different from the models of western capitalism. This is largely because the historical conditions and the overall global conjuncture are very different from what those countries confronted when they embarked upon economic growth. It is extremely important to realize that one obvious consequence is that the pace of movement out of agriculture will be necessarily much slower. This obviously implies that instead of aping contemporary models of corporate capitalism, which is what is being done by governments of developing countries, we need to find our own appropriate models which would ensure decent livelihoods to masses in rural areas. For reasons of space, we cannot elaborate here. 5. The introduction substantiated the first question with evidence on the destructive and self-perpetuating consequences of inequitable land distribution. Wealthy elites, who own the best lands, control and expand agricultural production for export, continually displacing the poor to ever more marginal areas for farming. The poor are forced to fell forests located on poor soils, to farm thin, easily eroded soils on steep slopes, and to try to eke out a living on desert margins and rainforest. As they fall deeper into poverty they are often accused of contributing to environmental degradation, and worse are treated as criminals on the charges of encroaching on what has come to be defined as public property. 6. The inability to own land in rural areas is closely linked to urban poverty. The landless poor must abandon the countryside in massive numbers and migrate to cities where only a lucky few make a living wage, while the majorities languish in slums and shantytowns. 7. Arguably, these dire consequences reaffirm the need to redistribute land through comprehensive agrarian reform. This is a basic prerequisite for the kind of inclusive, broad-based development that would allow nations to provide all of their citizens with a decent standard of living and make possible more ecologically sustainable management of natural resources. Compelling empirical evidence strengthens arguments for broad and effective land redistribution. For instance, as stated earlier, in India the redistribution of only 5 percent of farmland combined with better access to livelihood resources could reduce poverty levels by as much as 30 percent. 8. In addition, as the cases in this monograph showed, multiple actors and interests push for, partially support or all together prevent or block land reform. The economic and political elite of a country, external agencies such as the World Bank and the IMF, citizens’ initiatives and organizations, and NGOs influence land policies. Keeping in mind the contestations and conflicts between these actors, we then ask – how does land reform happen? 9. Land reform legislations and efforts at implementation have invariably derived from the force of peasant mobilization; it is the character of the peasant movement that shapes the agenda of reforms. Through political organizations, coalitions and alliances land reform demands have been pushed to the forefront of social justice movements and national policies. 10. The presence and pressure of multiple interests can break or make changes in land policy. In democratic countries, it was seen that governments paid lip service to the recommendations of NGOs while pushing through land legislation favourable to the landed and corporate interests. In other cases, such as Nepal, we observed small but effective initiatives such as the CSRC, a movement where the social and economic roles have been fundamentally altered and formerly subjugated people are now empowered. However, to replicate this experience within Nepal and the world requires sweeping changes in larger economic policy and intense pressure on state mechanisms. 11. The pressures of external agencies such as the World Bank on the agricultural policies of postcolonial nations also need to be read critically. As the case of South Africa betrays, it is clear that conditional policies intending to “integrate” countries into global markets and trade resemble a double sided-knife. On the one hand, the implementation of market-led land reforms has deepened poverty and inequality internally and on the other side, multilateral loans have buried South Africa in a cycle of debt. 12. Another important lesson to be learnt from country experiences (such as China, and Vietnam) is that a cultivator has to be the base of any agricultural enterprise, and policies should be targeted at enforcing her/his positioning as a primary agent of agrarian economy. State-enforced collectivization may often run into difficulties because of the loss of incentives on the part of the peasantry. It failed to take cognizance of the character of land as a living unit rather than a production unit. 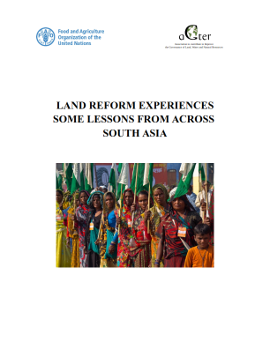 Any effort at land reforms, therefore, should follow a bottom-up approach, at least in policy formulation and implementation design at various stages. 13. The experience of countries such as Japan proves beyond doubt the economic viability of small farms, indicating that economies of scale are not an issue in agriculture. Wherever land reforms succeeded in redistributing a significant proportion of quality land to a majority of the rural poor, and when the power of rural elites to distort and capture policies was broken, the results have invariably been real, measurable poverty reduction and improvement in human welfare. 14. Therefore, development’s primary purpose needs to shift from large industrial farms focused on profits to small farmers with secure tenure, long-term productivity of their soils and conservation of functional biodiversity. 15. An unambiguous political direction combined with an elaborate structural intervention result in significant victories for land rights. Operation Barga, in West Bengal in India is a clear example of this. Here administrative officers recorded the rights of tenants while party workers from state government supported the tenants in mobilizing and claiming their right to land. Clearly, the lesson is that peasant mobilizations can influence and transform the economic regime when supported by broader networks and mechanisms. 16. Women’s right to land is an issue largely ignored by policymakers and organizations. Women sustain rural households through unpaid labour both within and outside the home, yet in most third world countries, they are far more impoverished than men. The lack of land and the inability to draw on its related resources prevents women from breaking the cycle of poverty. The enormous benefits of winning land rights for women are shown in improved family structures, better nutrition and rising incomes in rural households. 17. The gap between policymaking and implementation continues to debilitate possibilities of effective land reform. Thus, successful transformation of an inequitable agrarian structure warrants not only a pro-active state whose policy orientation derives from the needs and welfare of the masses, but also a peasantry which is not only conscious of its needs and interests, but is ready to seek them pro-actively. Mobilizations and movements have the power to impact political processes, which ultimately lead to policy transformation. Clearly, what is at stake is a model of development that is inclusive, rather than exclusive. The varied examples here prove land as a fundamental basis for citizenship. Internationally, strong social justice movements have been the impetus and motivation behind changes of overarching economic policies, and have inevitably encountered resistance from those in power. Both the state and international agencies have to come to terms with the fact that their policies will fail to survive if they continue to benefit the few at the expense of the majority. To make international economic policies and civil society ‘work for all,’ new paradigms that include all, need to be developed. The voices of citizens from across the globe show that alternatives to prevailing policies exist and can be created. It is this shared global experience that has, hopefully, revealed to us a variety of possibilities and lessons for the future of land reform. The full document can be downloaded on this page.